You’ve got a great brand story – a simple, yet remarkable story. 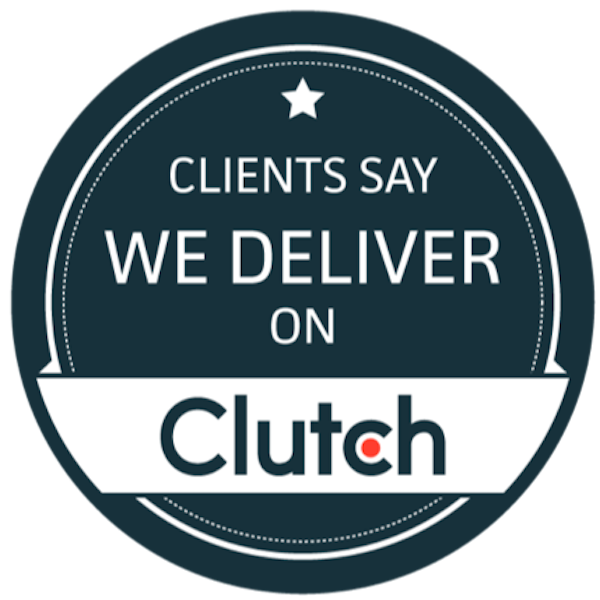 You’ve formulated your go-to-market strategy – a clear path to reaching your target customers with the right message, through the right channel, at just the right time to get them to act. 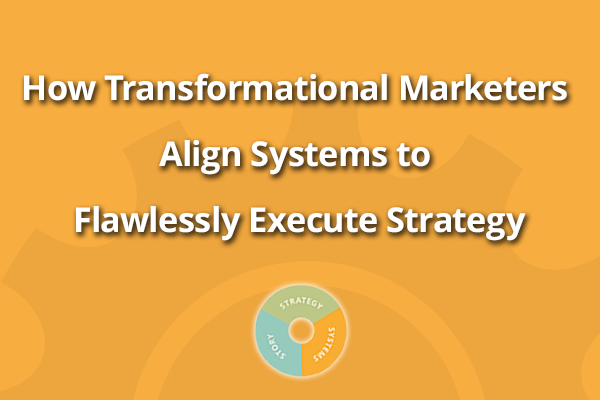 Now, all that’s missing to truly transform your marketing and is the alignment of the Systems you need to scale and deliver measurable business results. 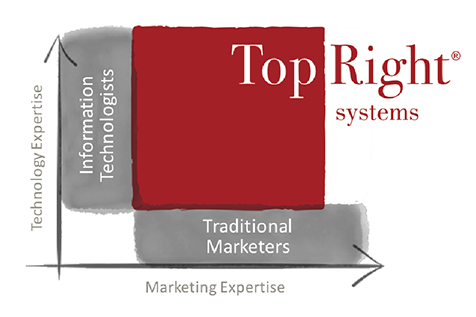 Marketing Systems enable you to flawlessly execute your strategy and measure the return on your marketing investment. To be clear here, when we say “Systems” it means much more than just technology. Systems include the business processes, measurement systems, and organizational capabilities required to deliver, track, and manage the customer experience across every customer touchpoint: from the earliest stages of the BuyWay through to the empowerment of advocates and brand evangelists. The best strategies are only as effective as their tactical execution. TopRight defines and aligns your business processes, organizational structure, performance measures, marketing technology and change management needed to efficiently operationalize the strategy, flawlessly deliver the customer experience and consistently measure the business results. From a business process perspective in many companies, marketing still functions in a silo, separate from nearly every other financial decision made in the company. Company leaders—who agonize over whether to build a factory to fill additional capacity, whether to make that next technology upgrade, or even whether to acquire another company—routinely make marketing decisions that appear as if they’ve left their spreadsheets at home. Marketing is an investment, pure and simple, not an optional expense or a luxury. [Click to Tweet] The processes that surround executing and tracking a marketing program should mirror the same processes that are put in place to ensure that every investment earns the necessary return. This level of discipline doesn’t exist in most marketing departments today. Many marketers claim that measuring results on tactics—from an advertising campaign to sponsoring an event—is too difficult or not worth the effort, as if this were akin to learning a foreign language. It’s not surprising that marketing has earned a reputation as big spenders who take no financial responsibility. Customer insights drive brand decision-making and marketing investments. [Click to Tweet] The term “investment”—rather than expense—connotes the way marketing should function. Just as you should think twice before you pour your 401(k) funds into high-risk tech stocks or your neighbor’s latest startup idea, so, too, should you think carefully before you gamble your marketing budget on a risky bet, especially when you likely have better options. Creatively minded marketers shouldn’t let all this “science” and “investment” talk overwhelm them. The art of marketing is now more important than ever. [Click to Tweet] The creative genius that drives brilliant marketing remains a critical part of everything that a marketer does. But the left-brain aspects of marketing—investment management and other fact-based processes—can be enabled and strengthened by marketing technology. 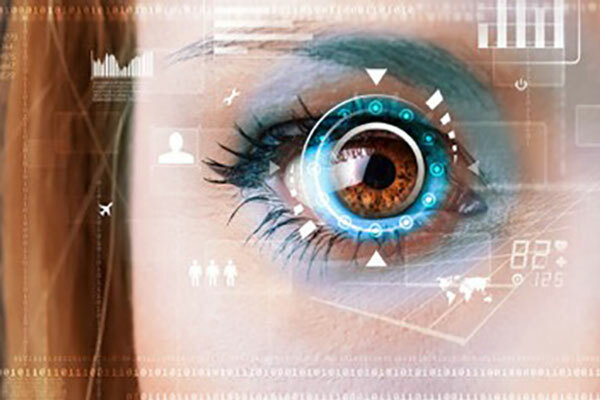 Furthermore, new marketing technology (MarTech) applications can give marketers the freedom to focus on brilliant creative ideas to deliver on strategy. The marketing investment approach, combined with creative drive, gives marketers an even greater ability to build their brand and drive value for their company. This is the Systems part of Transformational Marketing. The brand and its Story stand at the center of everything that marketing does. [Click to Tweet] The TopRight transformational approach to marketing indicates that the way to evaluate a brand is based on how much it sells, not on the kind of finger-to-the-wind approach that might show up on the front page of Ad Age. 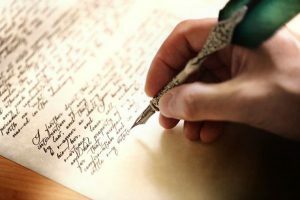 Brands are only valuable as long as they sell—ask Smith-Corona what they think of the value of branding in and of itself. Microsoft is a great brand, not because of some intrinsic value, but because Microsoft sells an awful lot of software. Everyone’s favorite example, Apple, is a great brand that excels at telling a great story, starting with, and being true to, its “why.” And, it’s the most profitable company in the world. Customer insights that drive decision-making must be both relevant and timely. [Click to Tweet] Compiling such information is an enormous burden for nearly every company on the planet, but it’s a necessary one. In addition to poor internal processes and measurement systems, marketing also faces obstacles in the form of departmental silos. These enterprise constructs force companies to think about actions from the standpoint of operations or sales, rather than from the standpoint of the customer. The construct of a functional silo is completely counter to the TopRight principles of simplicity, clarity and alignment. Silos create complexity for customers as the onus is on them to navigate disparate marketing, sales, finance and service channels. Governance and decision-making across functional silos can be unclear and confusing for both employees and customers. And consistent delivery of your Story and execution of your Strategy can easily become misaligned as handoffs occur from silo-to-silo. The 1990s era of corporate restructuring, exemplified in Champy and Hammer’s Reengineering the Corporation, brought down many of these silos. At the time, many companies decided that it was a good time “not to automate, but to obliterate” old ways of doing things. Unfortunately, these restructuring projects rethought processes for almost all sections of the company except marketing. Every other department has been reengineered and enabled by information technology. For too long, marketers have suffered behind the unseen walls that exist between marketing and all the other departments of the company. How can a company develop a remarkable customer experience for its customers that encompasses traditional selling and marketing activities as well as operations and services when it’s almost impossible to get marketing and sales to speak with one another? It is time for marketing organizations, and everything that makes them run, to be transformed from the inside out. Implementing a transformational approach to marketing cannot be accomplished with just a sheaf of studies or brainstorming. You have to put real changes in place that bring together organizational design, culture, incentives, processes, and marketing technology to make building and retaining a profitable customer relationship possible. Financial discipline and scientific rigor must take be involved in every marketing decision. [Click to Tweet] Otherwise, you’ll stay stuck in the past, gambling away your marketing dollars. 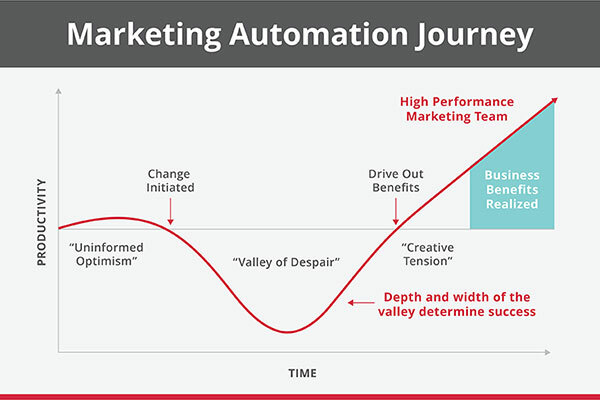 Sales and marketing technologies have evolved significantly in the past few years and solutions like Customer Relationship Management (CRM), Digital Asset Management (DAM), Multi-Channel Campaign Management (MCCM), Marketing Resource Management (MRM), Marketing Performance Management (MPM) and Marketing Automation Platforms (MAP) have now matured to the point that they offer marketers a robust set of capabilities for managing their marketing with the intentionality and strategic discipline of TopRight companies. The MarTech category of software applications is absolutely booming! 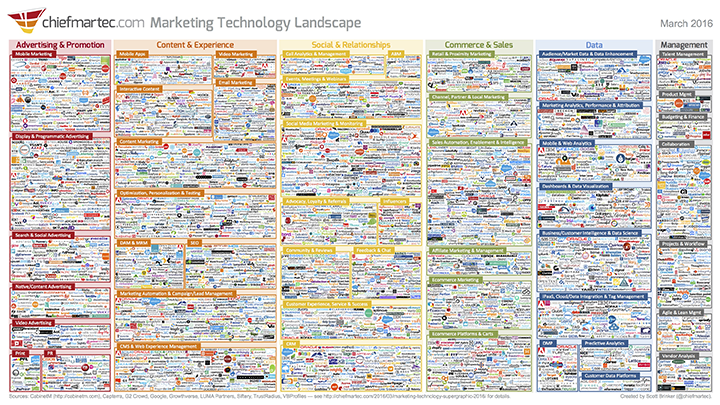 As evidenced by the expanding marketing technology landscape updated each year by ChiefMarTec.com CEO Scott Brinker, picking the right “marketing stack” for your business is more akin to finding a needle in a haystack. Adoption is now easier than ever since the vast majority of MarTech solutions are available in the “Marketing Cloud,” so barriers to entry are low for businesses of all sizes. Unfortunately, early adopters and many companies fail to realize the full benefits and potential of technologies in the Marketing Cloud. Like the famous line from the movie Field of Dreams, many software vendors promise you that “if you build it, [he] will come”—implying that the software possesses some mystical power to attract customers to your brand. “Field of Dreams” marketing ideas such as this never pay off. This false sense of trust in marketing technology is fundamental to many failures. Ironically, many firms have embraced a new mantra of “customer-centricity” and implementing MarTech has been at the heart of their strategy. 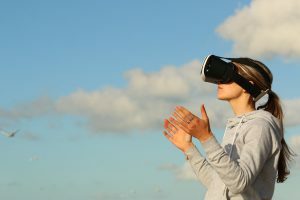 We encourage marketers to embrace these new technologies, but also caution them to understand that technologies are nothing more than enablers for marketing transformation. In and of itself, MarTech will not give you a new brand story, develop a winning strategy, or get more customers to buy your products and services. Market leaders use MarTech as a tool for gathering data about their customer personas, their journeys, and transactional behaviors. In turn, this data can be analyzed to reveal insight about trends in customer purchase behavior, to facilitate segmentation of the customer base, and to create customer preference for the brand over time. MarTech can be an amazing set of tools for supporting brand-building activities. But more importantly, it can serve as a scientific decision support system for making the right investments, in the right amounts, at the right times to optimize overall returns on marketing investment for the company. 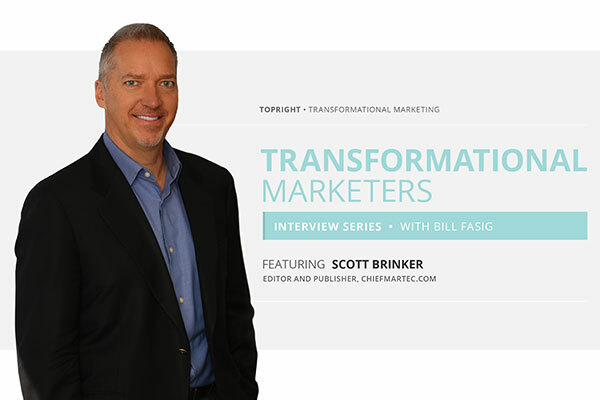 Transformational Marketing, as the name implies, is about optimizing and mobilizing all marketing assets to create lasting preference for the brand, to activate customer purchase intent, and to accelerate organic growth of revenues and profits. To truly transform, marketing must get all 3S’s right: the right Story, the right Strategy, and the right Systems, all measured through the lens of Simplicity, Clarity and Alignment. These are a lot of barriers to address, it’s true. It’s not easy work to make the marketing in your company function the way it’s supposed to: driving sales. But, it’s possible and the rewards are significant. Unleash the true power of your brand by applying TopRight discipline to your marketing techniques. 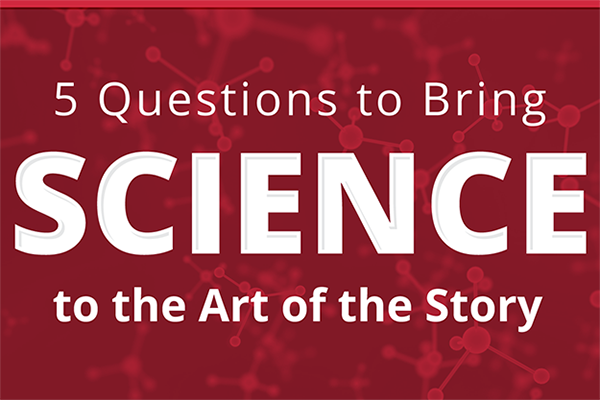 Apply science and art to your marketing efforts, and you can create productive conversations to engage your customer. 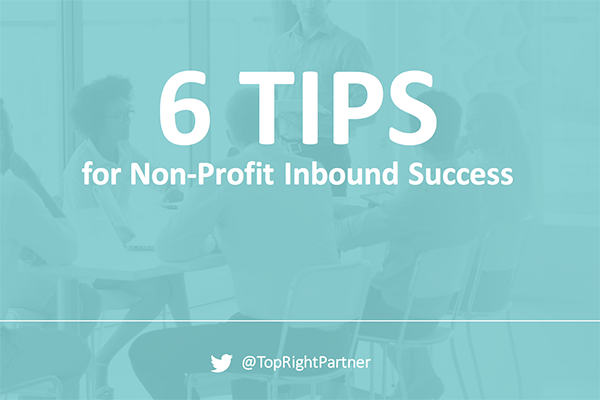 Engage your customer and convert them into advocates, and you can drive your revenues and profits ever higher. You’ve got a lot to tackle if you’re going to move to the TopRight. You have to develop a deep understanding—backed by some real scientific rigor and creative magic—of your market and your customers. Only then can you powerfully develop your brand’s story, strategy and enabling systems to communicate efficiently and effectively with your target audience, identifying different customer personas and tailoring your messages appropriately at every touch-point in their buying journey. 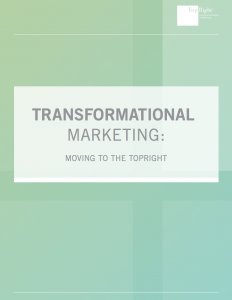 Learn how to transform your marketing through simplicity, clarity, and alignment of Story, Strategy, and Systems in our ebook Transformational Marketing: Moving to the TopRight.